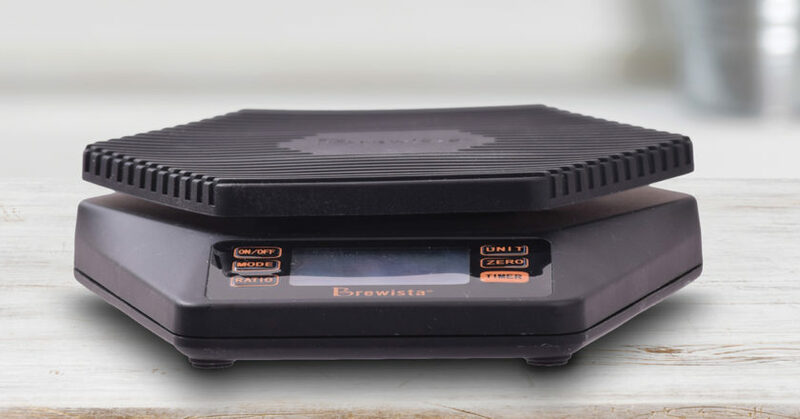 The Brewista Ratio Scale is the perfect tool for baristas and coffee-lovers who want to perfect their pour over. Unlike other high-tech scales on the market, the Ratio Scale is a simplified and more affordable alternative that automatically calculates the water-to-coffee ratio needed to produce your favourite pour over recipe. Based on the amount of coffee grounds used, the Ratio Scale calculates the amount of water you need according to the ratio you set, and shows the desired and actual pour rate as you brew. As soon as you place your vessel on the Ratio Scale, it will auto tare. Enter your desired brew ratio, then the scale will weigh the coffee placed in the vessel and tell you the precise amount of water to add. It’s all about keeping you accountable to perfect your brew recipe. As soon as you start your brew the Ratio Scale will measure the brew time and give live feedback to let you know if you’re pouring a little too fast or too slow, with the ability to adjust accordingly – it’s honest feedback. If your goal is to become a better brewer, then this simple and easy-to-use device will help you reach your target.